To use the Kii SDKs, you must first register your application on the developer portal. Once registered, your application will have an associated AppID and AppKey that you'll use to initialize the SDKs. Follow the steps below to register an application on the developer portal. Click the "Create App" button. This brings up the "Create Your App" menu. 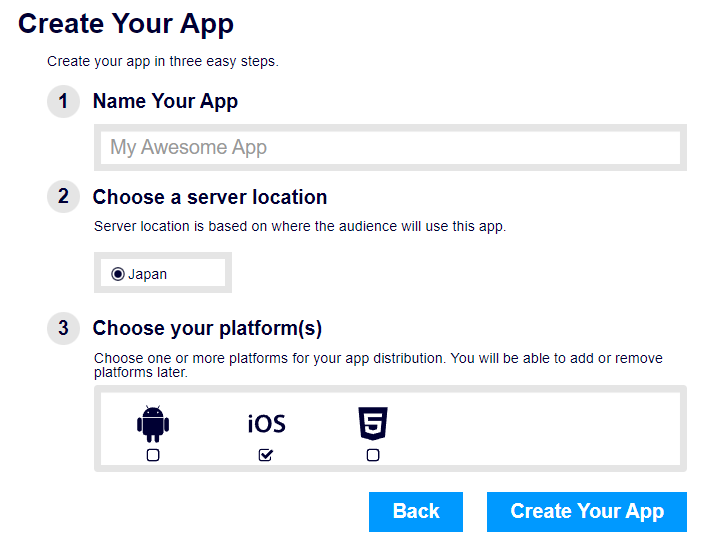 Enter the name of your application, select the desired server location and the mobile platforms you'd like to use. For more details on the parameters, see Application. Click the "Create Your App" button when you are done. The page to download SDKs opens. You can download the Kii Cloud SDK for iOS. The Kii Cloud SDK for iOS is the SDK to integrate into your iOS app to communicate with Kii Cloud. Continue to the next step if you will download it by CocoaPods. Click the link for the SDK if you choose to download it manually. Kii recommends downloading the Kii Cloud SDK by CocoaPods. In either case, see Adding the Kii Cloud SDK to learn how to integrate it into your project on the development machine. Click the "Finish" button. Now your application has been created. When an application is created, its access keys are assigned automatically. Of these keys, the AppID is used by Kii Cloud to uniquely identify your application. Please follow the steps described in Checking and Resetting Access Keys and check the assigned AppID. Record them for future reference. The AppKey is not used by Kii Cloud anymore. You can add collaborators to your application. The collaborators will have the privileges to access your application on the developer portal as the application owner but cannot add more collaborators. See Managing Collaborators to learn how to add collaborators.